Edible flowers make salads beautiful and add color to any plate when used as a garnish. Larger edible flowers - squash blossoms and daylilies - can even be used as vegetables and sauteed or stuffed. Nasturtiums and Johnny-Jump-Ups are sometimes available at fancy grocery stores; for the others keep your eyes peeled at farmers markets or, if push comes to shove, grow your own edible flowers. Note: Always make sure to buy spray-free flowers grown for human consumption and use them as soon as possible after they've been picked. 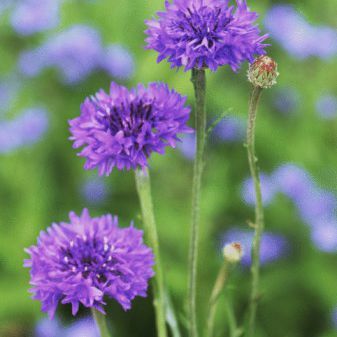 Bachelor Buttons, also known as cornflowers, aren't sharp when you bite them - but they sure look pointy! Their spiky look is their main appeal since their flavor is very mild - almost like a non-crunchy cucumber. Look for Bachelor's Buttons in blue, pink, purple, or white. In the wild, they tend to enjoy the company of poppies and will pop up to add a ​hint of blue or purple to fields of red flowers. The flowers from basil plants make easy, lovely additions to salads, great garnishes for dishes that have basil in them, and delightful additions to decorate a platter of grilled meats or vegetables. They are usually a soft green but can have white or purple tones. Basil flowers taste like... you guessed it: Basil. Taste basil flowers before using them, since they can be bitter. Borage has brilliant blue flowers that look fabulous in salads or as a garnish. Like Bachelor's Buttons, they have a vaguely cucumber-like taste. Calendulas, also known as marsh marigolds or field marigolds, have a bit of tang (although they're not at all peppery like nasturtiums). Their petals look like daisies and they come in orange or yellow. Be extra sure to buy carnations that have been raised to be eaten and not sprayed with pesticides. Carnation petals are a bit sweet, a bit spicy and come in a range of soft colors - white and pink look particularly pretty in salads. Taste each flower before using carnations, since they can turn bitter. Chive flowers are spiky little white to pink to purple balls that add a decidedly onion-like flavor to dishes. Yes, daylilies are edible. Use them like squash blossoms - stuffed and fried or chopped and added to dishes - rather than adding them to salads or as a garnish like most other edible flowers. Nasturtiums are probably the best known and most widely available edible flower. Nasturtiums have a real peppery kick (as do the leaves from the plant, which make lovely salads all on their own). Most are yellow or orange, although red nasturtiums are often available as well. The whole family of Violas can be eaten - from large Pansies to tiny Johnny-Jump-Ups. They have a velvety feel and extremely mild taste that can best be described as a bit like Iceberg lettuce without the crunch. Sometimes pansies have a slightly minty taste, so, as with all flowers, taste them before you use them. Zucchini blossoms can be chopped and sauteed or added to soups, or, in the classic Italian style, fried or stuffed with a bit of cheese and then fried.